Blinking ads, flashing banner ads, singing ads. Escaping advertising was already a hopeless endeavor online in the early 2000s when Web browsers introduced pop-up ads, an almost unavoidable trick by websites to generate revenue. Hundreds of angry Facebook groups have been created to deride pop-up ads. 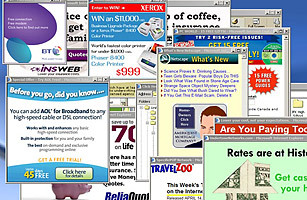 Though pop-up blockers were eventually created, you still never know when you're going to click on a link that will bring a flurry of pop-up ads or freeze the computer screen altogether.